Lil Country Librarian: The Best Pencil Sharpener Ever!!! Last year, I was given the opportunity to review a pencil sharpener from Classroom Friendly Supplies. I had read on several blogs that it was so quiet and wonderful and with the bad luck we've had with the typical metal wall mount pencil sharpeners we have installed, I was super duper anxious to try this one out. We quickly opened up the box and put the sharpener to great use. I was beyond thrilled at the fact that our pencils were now sharpening on all sides!!! Did you hear that? The entire pencil was sharp on all sides!!! :) I seriously think every single classroom needs this sharpener! My students absolutely love using this sharpener, too! We had to have mini-lessons on how to use it appropriately and I'm not kidding you, I had kids lined up to sharpen pencils with this cute little sharpener! They were so excited to be able to put a new pencil and it come out completely sharp and without eating their entire pencil like our old sharpener. Our previous sharpener would eat an entire brand new pencil in one sharpening and still leave one whole side unsharpened. It takes a bit of getting use to for some kiddos to use, but they are able to use it easily once they have practiced a few times. The kids mainly want to pull the pencil out without pressing the buttons together at the top and I'm afraid that might hurt it eventually. I have added 'Pencil Sharpener' to our classroom jobs. I have one student that sharpens all our pencils for us. He/she stocks up the pencil pocket with lots of sharp pencils for the week and we love not having the constant interruption of someone using the old wall mount sharpener, which was incredibly loud and obnoxious at all the wrong times. 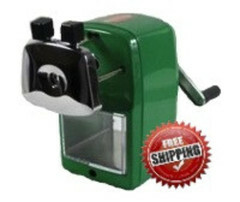 The "Groovy Green" pencil sharpener is on my budget list for next school year! I sure hope it's an item that doesn't get cut!!! After hearing ALL of the chatter about their wonderfulness...I've got to have one!! !